N.B. : I wanted to share with you this timely post from my friend, Ty Hoad. May it be as meaningful to you as it was to me. Like some of you, my family has been praying for rain here in Southern California for a while now. For those of you unaware, California is in the midst of the worst drought we’ve faced in 100 years. After months of praying, it rained Saturday night. And then again on Sunday morning. Did I ever rejoice in the rain! It truly was a miraculous answer to prayer! Standing at the end of my driveway on Saturday night in bare feet and head back letting the warm drops spill on my face, it was hard to tell my tears from the rain. The rain was a promise from my Heavenly Father, you see. No, I do not think this weeks’ rain will, nor was meant to, end our drought. I believe it was meant to encourage us in the midst of it. God’s presence is like that sometimes. He allows us to go through the hard, cracked, challenging, dry spiritual seasons — not to be cruel, or to cause suffering and loss (though sometimes an amount of loss is necessary) — to bring us to a place to get our attention. To bring into focus the things He wants us to see in the way He sees them. Drought is an interesting metaphor for the human heart. Without God, my heart and own resources look so much like the reservoirs I see on TV with no water left in them: Dry, cracked and caked with yesterday’s residuals and nothing much to expect tomorrow. Supposing the rains did come, I’d live with the knowledge that at the depth of my own reservoir, it does eventually come to an end having no spring or “source” to replenish it. I’ve tried to live life on my own terms and while materially I did “okay,” without a natural spring, there wasn’t much to depend on in times of drought. There wasn’t much to hope for past the pool I could draw from. So, like my friends who have yet to change their water usage in the midst of this season, I would pretend not to care or trouble myself with the actual condition of my heart… And just keep on keeping on… Spraying down the walk and watering my lawn…making sure everything looked good to the passers by… and “Hoping” there would always be rain — even when it wasn’t “supposed” to fall… I find it interesting that a life without God produces the same need as a life with God: reliance upon Him to deliver what is necessary even though we don’t deserve it. or we can choose to acknowledge Who it is that really sends the rain. I, for one, have turned my eyes and hopes to Heaven. Not just for the hope of ending the drought in California, but for the drought in the hearts of all humanity as well. It’s warm today. And dry. In February. And the next week of weather forecast appears to bring more of the same. So it came as no big surprise—a little, for sure—to find seagulls flying overhead this morning, even though I live about an hour from the Pacific Ocean. Yes, friends, the drought that has hit me and my southern California neighbors is taking its toll. For once, we’re thinking of ways to not use as much water as we usually do. Do we mellow if it’s yellow (yes, I said it)? Perhaps not wash down our driveways everyday? A whole new sense of responsibility is hitting us (do sense my sarcasm here). Seriously, though, the oddness of the weather is just one factor in my own life of the oddities of life. And as I look at these places within me, I notice that there is a strong drive to make things easy. To make them right. To make them…controllable. The activities of my life must have some aspect of control, lest I get jumpy, anxious, grumpy, out of sorts. 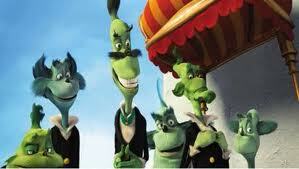 You’ll remember in the movie Horton Hears a Who that Mr. Mayor’s city council was quite determined to the same thing. When the mayor announced that he had noticed tremors, clouds swirling in the sky, and that sort of thing—“odd goings on”—the council was determined to make sure that they were indeed good odd goings on, all for the sake of maintaining a face of calm and control even when the evidences showed otherwise. So, whether seagulls fly over your Omaha skies or clouds swirling in the skies show up outside your window, may each of us be willing not to hide ourselves from the truth that is at the end of our noses.